YAOUNDE, Cameroon (AP) — As Cameroon electoral workers counted votes, an opposition candidate proclaimed himself the victor of the nation’s election, despite warnings from the electoral commission that only the Constitutional Council can legally announce the winner of the presidential race. Cameroon Renaissance Movement party candidate Maurice Kamto on Monday made the announcement in Yaounde, a day after the vote. “I call on President Paul Biya to ensure a peaceful transition and avoid situations that may be ugly for Cameroon,” he said. Kamto, however, didn’t give any figures to back up his claim. His supporters took to the streets to celebrate and armed separatists who had threatened the vote congratulated him on social media. Vote counting for the election began Sunday after polls closed. The official results must be announced by Oct. 22. Two observer missions have declared the elections to be fair. Biya, Africa’s oldest ruler at 85 and in power since 1982, was expected to easily take the vote and enter his seventh seven-year term. He faced off against a fractured opposition. Before Kamto made his claim, the government issued a stern warning against publishing any trends or estimated results ahead of the official announcement of the winner. Erick Essouse, director general of elections at the election management body ELECAM says the vote went smoothly in French and English-speaking regions, despite some incidents. The military killed two armed men in the English-speaking northwest town of Bamenda, according to Governor Deben Tchoffo of the Northwest region after fighting broke out. Several armed men had also been killed by military in the Southwest region, Governor Bernard Okalia Bilai confirmed. 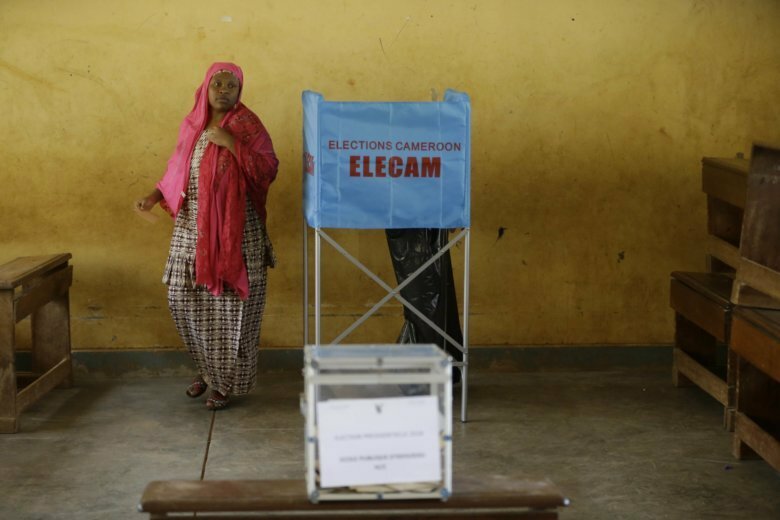 Fighting in Anglophone regions of Cameroon has increased in the run-up to the polls, with worries that residents there wouldn’t vote amid threats by separatists seeking an independent state they call Ambazonia. More than 7,000 observers monitored the election in which 6.6 million registered to vote. The African Union observer mission said the polls were fair, and despite reports of fighting in various regions, there were no major incidents to influence the election’s general conduct. The African Network for the Promotion of Democracy and Good Governance also said they were credible.